Summit Daily News: Walking Our Faith: What is Grace? You folks in dire straights who need free stuff, have you tried www.freecycle.org? I read the pleas for “help” in the daily Missoulian. Often, what folks are asking for is readily available from generous folks offering free stuff to give away on www.freecycle.org: furniture, food, vehicle parts, housewares, computers, building materials, do-dads and dust-catchers. Both Missoula and the Bitterroot Valley have Freeycle groups. It’s free to post both “wanted” and “offers.” A yard sale is a lot of work. Giving it away is a cakewalk. 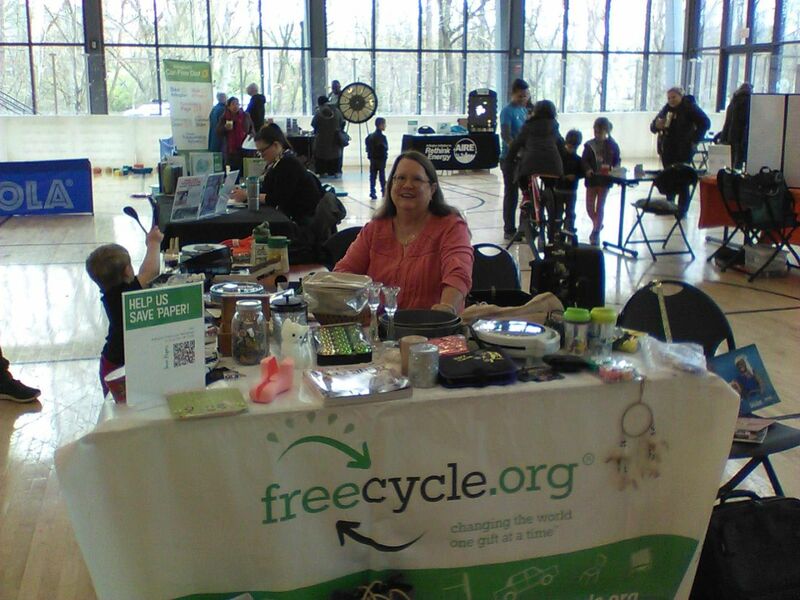 – No Impact Freecycle Extravaganza, 10 a.m.-2 p.m. in the atrium of the Havener Center. The freecycle is a no-money “yardsale.” The public is welcome to donate any household items they no longer use and take home any donated items they find interesting. No cash changes hands and leftover items will be donated to a local resale shop. Martini glasses. Magazines. A futon. Styrofoam packing blocks. These are just a few of the items I’ve Freecycled over the years. And boy was I relieved to discover that Freecycle was already established in Des Moines, since I had been a long-time Freecycler in the SF Bay Area. What is Freecycle? Well, I’ve had a few people ask me that. Especially when they see me leaving items in bags on my doorstep. 557306_10151082410412993_391868685_nFreecycle was started ten years ago by Deron Beal in Arizona. You can read the whole story here, but in summary, it’s a network group of folks who sign up to post items that they would either like to give away or they’re in search of. I’ve been on various Freecycle networks for years. It’s yet another way to keep stuff out of landfill, share with and help others in your local community, and meet some interesting people to boot. Back in San Francisco, I had a number of friends who were also in the same Freecycle network. We play the game of “okay, what’s the weirdest thing you’ve seen on Freeycle” because as you can imagine, there are some rather interesting posts. For me, I think the all-time weirdest item I saw “offered” (posts start as either “offered” or “wanted”) was empty dog food containers. And no doubt, someone took them. And I’ve seen some interesting “wants” too, like when I was a member of the Oakland, CA Freeycle group, and someone wanted a diamond ring. Well, why not. Four years ago, Mandy Moore of Chesterton saw someone was giving away a turkey on the Freecycle website. Out of curiosity, she contacted the giver and discovered 50 people wanted the holiday staple. Sensing an unfilled need in her community, Moore put together seven meals and put that up on Freecycle.